For a pilgrim arriving in Puri, it can be the beginning of an exciting journey of discovery. This is a truly ancient land that can trace its history to the time of the Mauryas in the second century BCE and it has many pilgrim centres dotted with temples of exquisite beauty. Over the centuries Odissa has been visited by scholars and wandering sadhus, from the Adi Shankaracharya to Chaitanya Mahaprabhu and Guru Nanak. Beginning with the Shankaracharya establishing the Goverdhan math here in the eighth century many such monasteries have been founded in Puri. Also there are a number of temples that are on the pilgrim’s spiritual trail in this supreme tirthasthana. 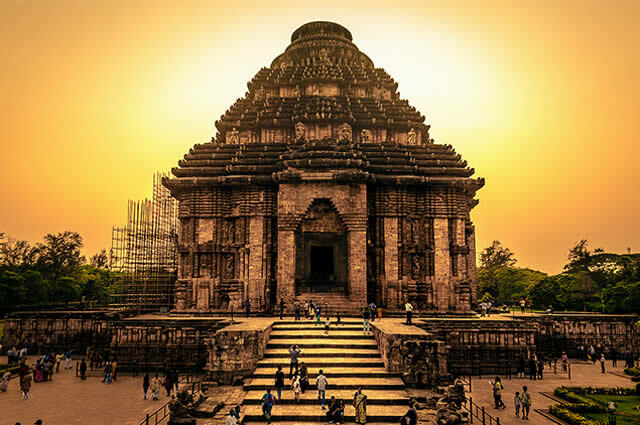 Pilgrims can also travel out of Puri and visit the classic temples at Bhubaneswar and the legendary Sun temple at Konarak and gather a complete visual and spiritual experience of the temples of ancient Kalinga. At Puri most of the temples and mathas that are popular with pilgrims are within easy distance of the Jagannath Temple. Many are connected to the saints who visited this tirthasthana especially Chaitanya. Next to the Jagannath Temple, the most important shrine in Puri is the Gundicha Temple that is part of the Rath Yatra. As it is said that Queen Gundicha is Jagannath’s aunt and he comes to spend time at her garden palace, so the temple is set within a garden. The saint Chaitanya used to personally clean the temple before the arrival of the chariots and now the ceremony is called Chaitanya Charitamrita. The temple comes alive during the Rath Yatra when the images of Jagannath, Subhadra and Balabhadra are kept here for nine days and worshipped with religious rituals. This is also the time when non-Indian Hindus can worship the images. 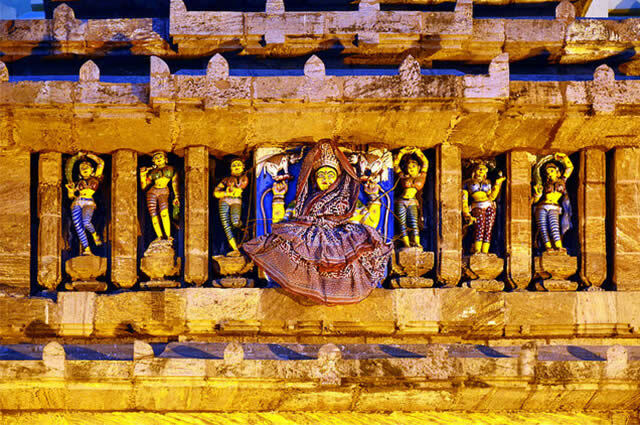 Near the Gundicha temple is the Narasimha temple, dedicated to the fourth avatar of Lord Vishnu. In the sanctum there are two images of the half-lion, half-human figure of Narasimha. One is called Shanta Narasimha or the calm deity and the other Raga Narasimha or an angry aspect of the avatar. Chaitanya was said to have rested here after cleaning the Gundicha temple. He also bathed at the nearby beach called Swarga Dwar. Many pilgrims bathe there before entering the Jagannath temple to participate in the puja. The Tota Gopinath temple dedicated to Krishna has images of Krishna and Radha and Balarama with his queen Revati in the sanctum. The tank called Narendra Sarovar where the festival of the Chandana Yatra is held has a small temple on an island in the middle of the water pool with the trinity images of Jagannath and his siblings. The Lokanath Mandir is a Shiva temple and the Salavega Peetha is named after a devotee of Jagannath named Salavega who was the son of a Muslim father and a Hindu mother. He was a great devotee of Jagannath and during the Rath Yatra the chariots pause before this temple on their way to the Gundicha temple. The pantheon of Hindu goddesses are worshipped at the temple called Matrika Mandir near the pond called Markandeya Sarovar. The temple is dedicated to the seven shaktis of Brahmi, Maheshwari, Aindri, Kaumari, Vaishnavi, Varahi and Chamunda. Among the monasteries the oldest and most respected is the Goverdhan math of the Adi Shankaracharya. He established many of the rituals at the Jagannath temple and even today all queries about rites and rituals are decided by the present Shankaracharya. The Vaishnava saint Chaitanya stayed at the Bada Radhakanta math with a sacred pond called Shwetganga. The Bhakti saint Ramdas who was the guru of the Maratha king Shivaji stayed at the Dakshina Parsva math. The Bauli math is the seat of Guru Nanak as he stayed there when he visited Puri and it is visited by Sikh pilgrims. It is now the Bauli Math Gurudwara with a Guru Granth Sahib that has been placed inside to commemorate Nanak’s visit in 1509 when he went to the Jagannath temple and composed one of his most beautiful hymns. If Puri is the land of Lord Krishna then Bhubaneswar is Lord Shiva’s kingdom. The name derives from Tribhuvaneswar, lord of the three worlds, one of the names of Shiva. The city is called the ‘cathedral city of India’ as it has many big and small Shiva temples and among them are examples of the finest of Oriya architecture. The soaring rekha deuls or spires of the shrines pierce the skyline as if reaching out to the sky in worship of the Great God. The great Oriya kings all added temples to the city that was founded by King Yayati of the Kesari dynasty in the 10th century. He also built the great Lingaraj temple which is the biggest temple in Orissa with a forty five metre high spire. Like the Jagannath temple, the Lingaraj is a living shrine with daily worship being performed before the shivalingam in the garba griha that is called a swayambhu or a self manifest lingam. The main temple called Shrimandir is surrounded by many smaller shrines in a large temple complex. Among the other temples worth visiting in Bhubaneswar is the Vaital Deul that is older the Lingaraja temple and dedicated to the goddess Chamunda. She is a fierce aspect of the goddess Durga and the image is of an eight armed goddess carrying weapons. The temple is built in a mix of Hindu and Buddhist architectural styles that creates a surprisingly elegant synthesis. The Raja Rani temple was built in the 11th century and was probably not completed as there is no deity in the garba griha. The outer walls are covered in beautiful carvings and the cluster of spires rising to the tallest deul makes this a very unusual temple. At places the carvings remain incomplete but history does not tell us why this beautiful temple was so mysteriously left unfinished. In a desolate beach in Konarak stands one of the classics of Indian temples, that is today a UNESCO World Heritage site. It is a shrine dedicated to the sun god Surya. Hindus often start the day with a prayer called the Gayatri mantra that is an invocation to Surya. This temple facing the direction of the rising sun is like a transformation of that prayer into vibrant stone. In Hindu mythology Surya is depicted as a god appearing on the horizon at dawn riding a seven horse chariot driven by his charioteer Aruna, the god of dawn. He rides across the sky during the day to sink in the west and appears once again the next day as a giver of life and light through its beneficent rays. Even though the main sanctum is completely ruined and the main image has vanished, there are standing images of Surya made of a pale chlorite stone called Parsva devatas set in niches in the walls. These images are placed in such a way that they catch the rays of the sun at different times of the day. The forgotten architect of this magnificent temple, the Surya Deul imagined a temple like that chariot of Surya. So along its side the walls are carved with twenty four giant wheels, for the hours of the day. Then seven horses prance before it as the days of the week and it appears as if the temple has risen from the turbulent waves of the sea itself. 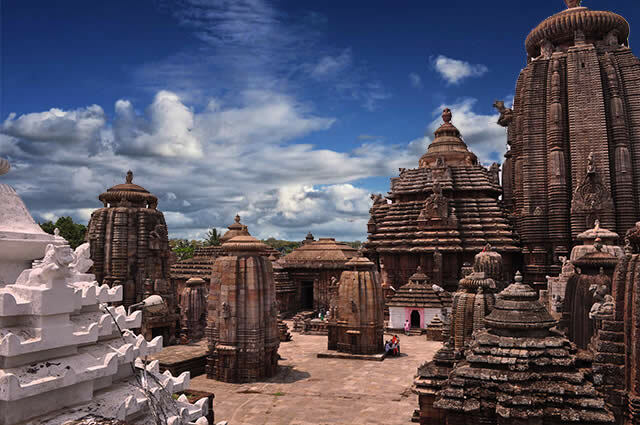 The temple was built in the 13th century by King Narasimha I of the Ganga dynasty at a time when Konarak and Puri were both important sea ports. The temple has been badly ruined in the centuries but still retains a magnificent majesty. Sailors going along the Oriya coast called the Jagannath temple at Puri with its whitewashed walls the ‘white pagoda’ and this dark ruin the ‘black pagoda’. The pillar called Aruna Sthamba that has an image of Aruna on top was taken from here and placed before the gate of Simhadwar of the Jagannath temple. The walls still carry exquisitely carved images of kings and dancers, gods and goddesses that are some of the finest works of the sculptors of Orissa.